Millennial Reign formed in 2010 by Guitarist Dave Harvey(ASKA) who took on the task of creating this new band as a side project. before long, Dave added Drummer Brian Diffee and Vocalist Trae Doss to complete the band. All guitar, bass and key tracks were written and recorded by Dave Harvey as well. 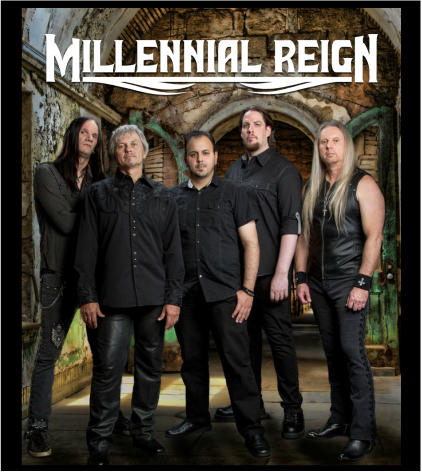 In 2012, Millennial Reign released their debut self-titled full length album on an independent label via The Recovery Room Studio with engineer Ty Sims. With this first release, Millennial Reign has made their mark in the Rock community with some well executed 80's era AOR style music. Millennial Reign got off to a good start with this 2012 release where fans of traditional Rock, who like bands like Halo, The Brave, and Sure Conviction, are sure to want to secure a copy of this debut album. In 2015, Millennial Reign released their sophomore album titled 'Carry The Fire' Which has now joined the ranks with many other great Power Metal bands. 'Carry The Fire' quickly gets the blood flowing as it takes off with track one and never lets up throughout the entire disc . Hats off to Ulterium Records for the fine production found on this full-length release. With this sophomore album, we find that the band has undergone some major changes. With the first being that MR has traded in their traditional Rock status to become an over-the-top Power Metal outfit. The other major change in play is notably with the lead Vocalist position. The former Vocalist Trae Doss left the band and was replaced by Vocalist James Guest(Eden's Realm). We find that the Vocal dynamic has changed drastically from Trae to Guest as it has gone from a polished, melodic, 80's era, Vocal style - to the heartfelt, Blues infused, soulful delivery of Vocalist James Guest. Also, we find that the band now has a second guitarist found in Jason Donnelly. Finally, there was an additional lineup change with Drummer Bryan Diffee being replaced by Drummer Wayne Stokely. On this 2015 sophomore release, Millennial Reign takes you by the hand and leads you down a path of epic proportions that will not only appeal to fans of 80's Metal/Rock but will also appeal to fans looking for Metal with a more modern day fill to it. This epic adventure starts with some epic artwork by Felipe Machado Franco. From first glance, The album artwork grabs your attention and makes you wonder what's inside. Guitarists Dave Harvey and Jason Donnelly continue the epic theme by incorporating some Folk Metal enspired guitar noodling that can be heard in the tunes: "Way Up High" , "Men Stand Alone" , "Will You" , and "I'll Try". The epic theme is further carried out by Dave & Jason with some sick galloping guitar riffs that are found throughout the album which makes this listener very happy. There's something to be said about the professional guitar work by our duo guitar team on this album. Everything from the many time changes to the varying power chords mixed with general noodling to the crossover moments of Thrash like riffage that ever so cleverly was slipped in. James Guest steps up to the challenges that are presented for a Vocalist of the Power Metal Genre and does a fine job for this 2015 recording. Just like with his band 'Eden's Realm', we find that there is a strong similarity between James Guest and Steve Perry(Journey). However, on this release, Guest stretches himself to new limits and we see him coming more into his own helping to make this one of his strongest efforts to date. Our percussionists are Bassist-Daniel Almagro and Drummer Wayne Stokely who both hold their own and help to round out this Millennial Reign team. Daniel Almagro was previously with a Power Metal band called 'Infidel Rising' before coming on with MR and brings to the band his knowledge and expertise of this genre. 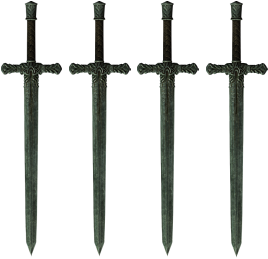 (See Site Info for Sword Scale Meaning)This rating is for the album 'Carry The Fire'. If you love Power Metal and are into bands like Theocracy, Harmony, Bloodgood, Journey, or Worldview then you won't want to miss out on this one because Millennial Reign has pulled out all the stops and released a solid follow up album that demands attention.